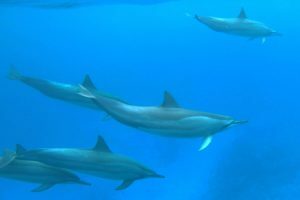 There are plenty of dolphins off the Kona coast, most of which are Hawaiian Spinner Dolphins. They are smaller than the better known bottlenose dolphins which can make them more difficult to spot. That is, unless you find them during play time. They are named Spinner Dolphins for a reason. That reason, as you might have guessed, is the way they spin when they leap out of the water. Keep your eyes open while sitting on the beach, or any time you have a good view of the Kona shore (beachfront hotel room? restaurant overlooking the water?) Binoculars can certainly help. 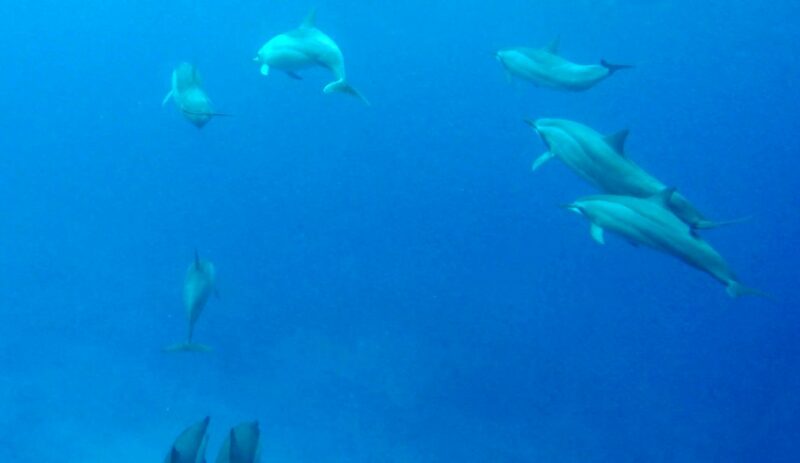 You might even run into some of these dolphins on a Kona snorkeling trip. Of course there is no guarantee of seeing wild dolphins, but if you have your heart set on meeting these playful creatures you might want to consider booking a dolphin tour. On a “swim with dolphins” tour, the only real itinerary is looking for dolphins, wherever that may end up taking your boat. 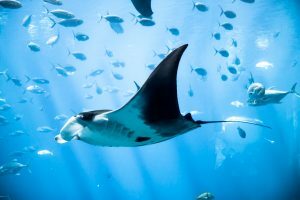 You have a much greater chance of seeing them, and seeing them up close, than you do on any other type of snorkel tour that is taking you directly to a snorkel site. I’ll take a moment to mention that there is some controversy over swimming with wild dolphins. More specifically, there is concern that human interaction may be harmful to the spinner dolphins. Before you decide whether or not to book a tour, read more about the controversy here. I’m going to answer some of the questions you may be wondering about for your upcoming tour and I’m going to use two separate experiences to do so. One, of course, is the dolphin tour that I booked and experienced for myself. The second is a tour group that I witnessed from the balcony of my condo the next day. These tours are very dependent on the location and the mood of the wild dolphins and may vary greatly from one tour to the next. Q: Did you see dolphins? A: Yes! In both my tour, and the tour I was able to watch from my balcony, the tour groups saw dolphins. Here is a quick video of the dolphins I saw on my tour. Q: Did you swim with the dolphins? A: My tour – Yes, but only briefly. We were only allowed 3 attempts to swim with the dolphins. If the dolphins did not want to swim with us after 3 tries then we would go to another snorkeling site so as not to harass the dolphins. We also were not allowed to get into the water in the immediate vicinity of the pod to make sure we didn’t startle them. After spotting the dolphins from the boat we would watch them to determine what direction they were swimming. Our captain would take us a good distance in front of the pod (at least a football field ahead of them), we would get into the water, and hope that the dolphins would join us shortly afterwards. On the first two attempts the dolphins changed directions before they got to us. On the third attempt we had better luck. 5 dolphins swam underneath of us or close enough that we could clearly see them through the water. None of the dolphins stuck around though, we just got to see them in passing. Other tour – Yes! In the tour I was able to watch from my condo’s balcony the dolphins stayed in the area of the swimmers for a very long time. 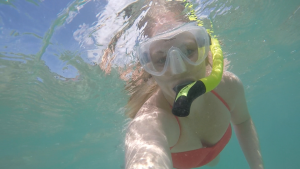 It seemed to be at least an hour that the snorkelers were able to swim with the dolphins. Looks like I booked my tour on the wrong day. Q: How close did the dolphins get to you? Did they interact with you? A: While we were in the water the dolphins didn’t get too close, but luckily the visibility is so fantastic in Hawaii that we could see them perfectly clearly. If I had to make a guess I’d say the dolphins stayed about 20 feet away from us. The dolphins didn’t interact with us in the water, we just watched them swim past. Once we thought the dolphins had left the area we got back onto our boat to head to a snorkeling site. On the way the dolphins had one last surprise for us. They swam right up to our boat and followed us along for quite a while. We were on a small zodiac boat so while we were cruising I was able to lay over the side of the boat and reach my GoPro into the water to take some video of these dolphins swimming along side and underneath of us. The dolphins were swimming very close to our boat, probably not more than 5-10 feet away. Q: How many other tour groups were around? A: My tour – We had a lot of trouble finding a pod of dolphins on the day of my tour. We probably rode up the coast for at least an hour before we found any dolphins at all. According to our captain this was pretty unusual. Clearly the other tour groups were having the same problem, because not long after we found a pod of dolphins it seemed that every other tour operator in Kona showed up at our same snorkel site. This mass number of boats and snorkelers (at least 10-15 boats) is likely the reason the dolphins didn’t stick around for very long. Other tour – In the tour I was able to watch from my condo’s balcony there was originally just one tour boat snorkeling. Eventually a second boat of snorkelers joined in but the dolphins stuck around a while longer, so they didn’t seem to be scared off. Q: How deep was the water? A: There wasn’t a set location for this tour. We stopped and got into the water wherever we found the dolphins. There were a couple of times where the water was deep enough that you couldn’t see the bottom. The visibility is excellent so when you can’t see the bottom you know the water is quite deep. Q: Did you see any other animals besides the dolphins in the water? A: Where the water was deep enough that we couldn’t see the ocean floor we didn’t see any other animals. When we stopped in spots where you could see the ocean floor and the coral on it we could also see small colorful fish. We did not see anything larger like turtles, stingrays, sharks, or whales. Q: Who should you book your tour with? A: The tour companies all look for dolphins in the same areas, so I don’t think any one company has a better chance of a dolphin encounter than the next. Things you should consider are the size of the tour group and how respectful the company is of the dolphins. A smaller tour group means less commotion while everyone is getting in and out of the water. This is likely to increase the odds that the dolphins stick around for a while instead of swimming away once you get into the water. I booked with Dolphin Discoveries and had a fantastic experience. In addition to small tour group sizes, I felt that the captain was very respectful of the dolphins. I would highly recommend booking with Dolphin Discoveries. Do you have a question that I didn’t answer above? Leave it in the comment section below and I’ll get back to you!